What does the SPO consider to be a “collaborative need”? NASA researchers encounter technology needs often fulfilled via procurement, SBIR/STTR, and internal R&D vehicles. Other needs, however, fall outside the bounds of existing programs that may be met through creative collaborative partnerships. For example, assume a NASA researcher has insufficient funding/equipment/materials/skills to meet an R&D challenge through existing programs. An industry/university/government partner could supply part or all of the needed funding/equipment/materials/skills to NASA in exchange for an option to license any resultant inventions, if interested. Similarly, NASA may seek an industry partner to commercialize NASA’s successful R&D and then supply product back to the Agency to meet mission needs. While many unique scenarios exist, in all cases GSFC would benefit from a collaboration with an outside third party. In suitable situations, the SPO can help NASA researchers to seek out such partners, vet candidates, and establish win-win agreements to make the collaboration a reality. Similarly, the SPO can help external partners to explore such collaborative opportunities within GSFC. Who can pursue meeting a collaborative need with NASA GSFC? 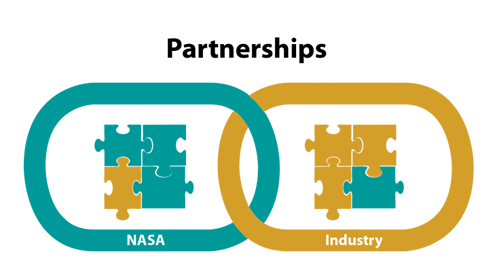 Any organization can collaborate with NASA including corporations, startups, individuals, universities, institutes, and other governmental agencies. While foreign collaborators can be considered, a preference exists for domestic collaborators if multiple collaborators are being considered. How does one find out about potential collaborative needs to pursue with GSFC? Processes surrounding licensing and SBIR programs are relatively well defined. The pursuit of collaborations, in general, is more about pursuing unique opportunities on a case-by-case basis. The SPO often does not “post” collaborative needs on a Web site or offer a formal solicitation. Instead, the SPO (using its own network and researcher suggestions/connections), reaches out to find a potential collaborator that might share NASA’s interests. Oftentimes, the initial collaborative idea may morph into a very different project once parties begin brainstorming together. Thus, NASA researchers (internal inventors) and outside parties (external partners) should reach out to the SPO at any time to consider collaborative pursuits (contact the SPO). Following various discussions, both parties determine if grounds exist to pursue a potential partnership. Sometimes, letters of intent or memorandums of understanding are utilized to codify mutual benefits and actions without substantial legal paperwork. When appropriate, the SPO serves as the intermediary between the GSFC researcher and outside party to establish the appropriate agreement that can establish the partnership in a way that satisfy governmental regulations. Agreements are signed, parties collaborate, and hopefully win-win results ensue.